Nestled in the aspen and pines this cabin is in a perfect location for getting off the grid and enjoying private trails on the tranquil side of the Continental Divide. Our Elk Run Trail is snowmobile packed for non-motorized recreation and is a great hiking trail in the summer. Steamboat is about an hour away. The setting is secluded. The deck is a place you will spend a lot of time looking out at the view. The Marmots, (Whistle Pigs), will often make an appearance. Wildlife abounds, Moose, Deer, Elk, Pronghorn, Eagles, Hummingbirds, and many other critters live here. The place is very comfortable and clean. This is a tranquil place to unwind. Our directions here are best as other methods aren't reliable. 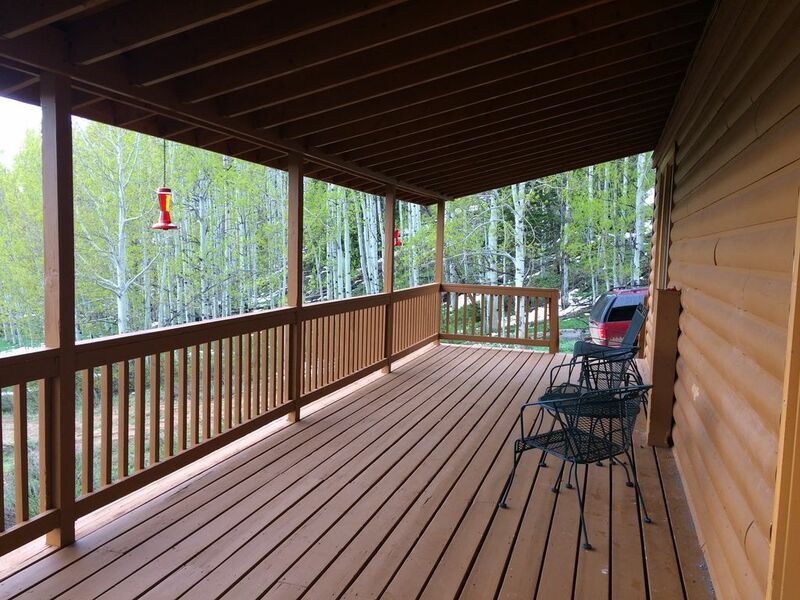 The Whistle Pig Retreat's deck overlooks the forest and chokecherry bushes where birds of many species perch. The home is cozy and warm. The kitchen is fully equipped. There is a queen bed, sofa bed and a inflatable mattress. The bathroom is fully furnished with a shower/tub, toilet, and his-and-hers sink. There is a washer and dryer. All this with plenty of recreational opportunities right here. Routt National Forest and Mount Zirkel Wilderness with 100's of miles of trails and over 70 lakes is just up the road if you want to drive or you can hike from the cabin on the property. 22 West Cabins offers hiking opportunities right here. Check out our trail dubbed "Narnia" which takes you to where two waterfalls merge on the Roaring Ditch from about May until about the first week of July. The road to the cabin is private. Currently the road is closed. The walk in is a 5 minute trek on a packed trail. We can also assist with your gear. We are 22 West. Eli and Pat are 6th generation and Deb is 5th from a long line of Irish immigrants and brave, stubborn, hard working ranchers. Our land was generously gifted from the kindest, hardest little working woman, Sarah Iris Irvine, whose desire was to keep this land in our family at a huge sacrifice to her. Our rentals also help to support North Park Wildlife Rehabilitation. Deb cares for injured and orphaned wildlife in Jackson, Routt and Grand counties. 22 West is located 18 miles southwest of Walden, CO along the Park Range, Routt National Forest and the Zirkel Wilderness. Deb and her mom Sarah Iris were both born here in the old homestead which can be seen from the cabin. This is home, where our roots run deep. Routt National Forest and the Zirkel Wilderness are a short distance away. His and hers sink and shower. Routt National Forest and Mt. Zirkel are just up the road or a hike from the cabin. We had a wonderful stay at the Whistle Pig Retreat! It has some of the most amazing views I have ever seen, a lot of wildlife wandering around and just peaceful. Pat and Deb were really nice and great hosts and we are really really looking forward to going back. I booked this for my boyfriends birthday and he said it was one of his best birthdays! Thank you and we hope to see you guys again soon! What a great place. Can't wait to return! A beautiful cabin in a beautiful location. It has everything you could need and is very warm and comfortable. Deb was a great host and we would love to come back again soon. Thanks Deb! You are going to think that I was friends with Deb or that Deb paid me to write this review, both of these are not true. What is true is that Deb's hospitality, understanding, and her cabin in the woods are beyond satisfactory! The cabin is perfect if you want to get away from it all. It is very secluded and you won't be bother by anyone else. Furthermore, the mountain behind the cabin is beautiful and the sunrise from the porch was worth every penny. Furthermore, I bet staying at this cabin in warmer months is amazing as you will be be tucked in a grove of aspens - I hope to come back in the fall! The cabin itself is very comfortable and has all the amenities you could ask for. As for Deb's hospitality - I won't say to much about my own circumstances as it makes me look like a terrible guest, however, suffice it to say - Deb was incredibly understanding about everything even though I was a huge inconvenience to her more than once. Deb has a heart of gold and if you are looking for a couple of days in the mountains away from the hustle and bustle - this is the place! Also, if you are into wildlife viewing, there are a lot of really cool animals nearby! Check it out. This was a lovely little cabin, with just about everything you might need in a pinch. The location was awesome as it lay within the aspen trees, and the view was awesome as well. We saw fox and many deer. We stayed nice and toasty with a well working furnace. The one day it snowed, and we found a terrific puzzle to put together! My only concern was the smell of urine in the bedroom, most likely from a prior dog that stayed before us. Other than that, it really was fantastic. We are glad you stay was enjoyable. We were unaware of any pet accidents but will shampoo the carpet. We were at the Whistle Pig Sept. 24,25,26, 2018 just in time to see the aspens turning. If you are like us, you will appreciate the quiet solitude and wonderful views from the front porch and windows keeping a look out for the deer, moose, foxes that can appear at the doorstep and in the surrounding trees: and in the distance the far off mountain peaks. This little home was comfortable, clean and had all the amenities needed. Deb is a gracious host. I stayed 8 days at Whistle Pig Retreat and loved it so much I immediately rebooked for next year! Deb comes up to fill the hummingbird feeders every day and can provide all kinds of information about the area and the wildlife...she also runs a wildlife rehabilitation service for 3 counties in North Park and some of the proceeds from the rentals go to support her noteworthy efforts. She is also full of information about the surrounding area and can point the visitor to trails and other activities. I was visited by deer almost every day, by a fox, chipmunks, and a bunny. Outside the immediate area but along the roads to reach the cabin I saw coyotes, antelopes, lots of rabbits, and deer. The mornings are beautiful as the sun comes up over the ridge and trees and you're greeted by the lowing of the cattle beyond, by the hummingbirds (in season), and by some furry friends. The inside is simple and modern with a good kitchen, dishwasher, and nice living room. There is NO cable and no Wi-Fi, so be prepared - there was good enough cellular to send and receive texts and make an occasional call. This was exactly what I wanted but visitors should be prepared to take some time off the electronic highway. i highly recommend this rental - you won't regret it! Routt National Forest and the Zirkel Wilderness are just up the road or you can hike from the cabin. Please check your weather before you head out as mountain conditions can change quickly. The Jackson County Road dept. does not plow on weekends or holidays.